There is absolutely NO doubt that sweater weather is upon us. Actually, it's been more than just sweater weather around here. The cold snap that we had made it feel more like "layer on every single hand knit you own" weather. At least, that's how cold it has been for me. The Mister and I have been trying to hold out for as long as we could before we had to turn the heaters on but then last week the house started to feel colder inside than out, so we gave in. I really shouldn't be complaining though, as nippy as the west coast has been lately, we're still snow free (for now) and nowhere near how it's been like in the rest of Canada. Or even Buffalo! It's cold weather like this that make me grateful that I'm a knitter and that I'm somewhat well stocked for cozy and warm hand knits! While the sweaters aren't falling off my needles as fast as I would like them to, the ones that I currently have in my wardrobe are all in heavy rotation. All the socks that I've been whipping up throughout the year are no longer hidden in the confines of my dresser, but are now a staple in my daily attire. With such consistent wear of all my hand knits comes the need for a regular maintenance routine: de-pilling, inspections for holes or other signs of wear, fixing loose buttons, and most importantly, washing. I don't know if there's a right and wrong to it or what other knitters do, but I don't wash my hand knits after every wear. Depending on how often I've worn a garment, I generally wash my sweaters, shawls, mittens, and cowls once or twice a season; hats once a month; and socks after 4 or 5 wears each (sorry if that grosses some of you out). It's crazy to see how much makeup can build up on hat brims (which can lead to acne breakouts!) and/or how much hair products can add up and amplify the overall griminess (lately I've been a fan of dry shampoo!). Needless to say, hats can get pretty gross and regular laundering should be a requirement. I'm lucky when it comes to socks though, as my sock drawer is substantial enough that I can go at least 3 weeks before I have to wear the same pair again. I also wait until I have a small pile of socks of at least 5 or 7 pairs before I do a wash - it's just more time efficient that way and it's so much easier to have to drag out my drying rack once in a while rather than having socks in various stages of dampness all over my tiny place! 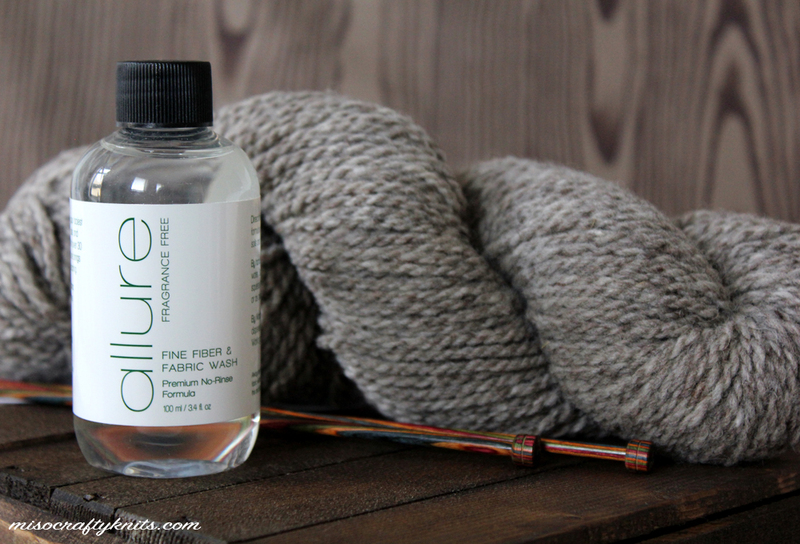 When it comes to washing my hand knits I'm a huge fan of using no-rinse wool washes. I've tried other methods like hair conditioner, baby shampoo, and basic dish soap but found that they either left an oily residue or too much fragrance, or they simply took way too long to rinse out. Not to mention that the excessive handling of a wet hand knit just made me overly paranoid about stretching and felting. Besides, I've got better things to do with my time - like knitting! - than to stand, hunched over a sink trying to rinse Palmolive off of my precious hand knits. No thank you! 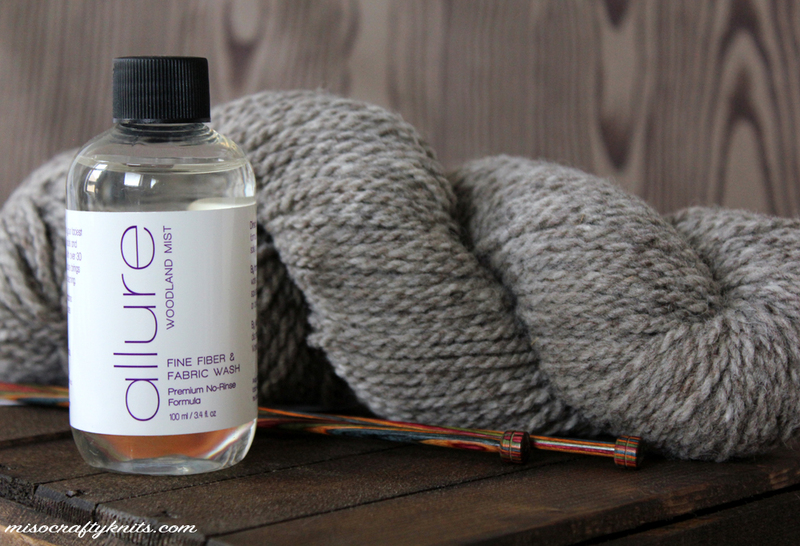 Recently I was sent a sample pack of a new fibre wash called Allure by Bijou Basin Ranch to try out and review. 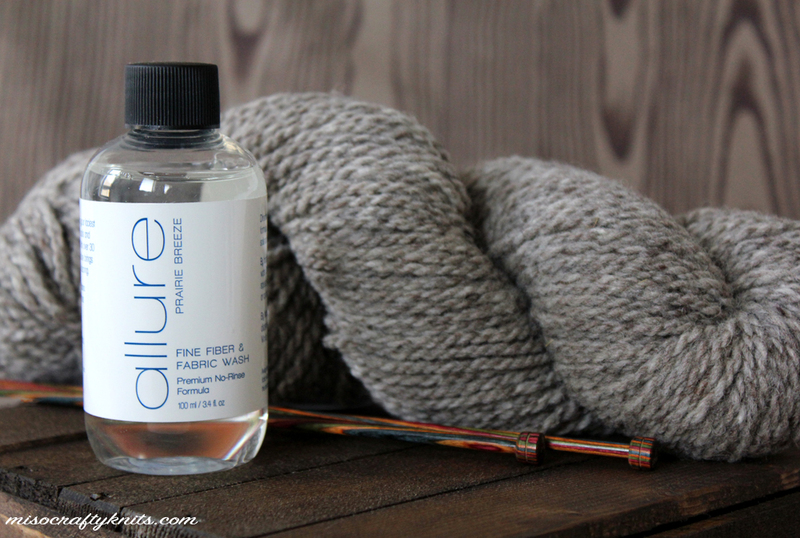 I have to admit that my interest was piqued as I pondered what made Allure different from all the other fibre washes on the market. Cause really, once you smell one lavender scented detergent, you've smelled them all. Right? Well imagine my surprise when I ripped open the box, took a sniff from each of the 3 bottles I was sent, and discovered that none of them smelled of lavender (or any other typically used flower scent) or of some citrus fruit. Now that's a good first impression! The first thought that came to mind when I took a sniff of this scent was of how the Mister would like it. He's never complained outwardly to me about it, but I know the Mister isn't a fan of the usual fruity scents that I normally have on hand. According to the Mister, Woodland Mist "is like a cologne...but not" and "smells neutral enough to be unisex". And I have to agree with him. After a few more sniffs I can honestly say that you can't classify Woodland Mist as girly or manly. I really don't know how to describe it other than it reminds me of something like that soft soothing scent that you breathe in when you hug your crush or loved one that brings a smile to your face and that you wish would linger around longer. It's a warm scent with a hint of vanilla, but not so much so that it's overwhelming or perfume-y, but gentle and calming. Prairie Breeze is definitely my favourite of the 3 scents. It has a delicate, earthy hint to it without being overpowering. I picked up on the bergamot and vanilla notes immediately but was really surprised to read on the Allure website that the base consisted of sandalwood and musk. All my life I've stayed away from all things musk-like and had kept quite the distance with anything sandalwood as I find these aromas to be too much for me and for my bloodhound nose to handle. So I'm really taken back by how much I like Prairie Breeze - so much so that I've already used it 4 times now! I'm a firm believer that every knitter should have a bottle of fragrance free wool wash tucked away in their laundry room. Even if you're a selfish knitter, there's always those few (maybe rare?) times that you need to knit a baby item or a small quick gift. I don't know about you but when I do any gift knitting, and especially with baby knits, I like to wash the knit before handing it over to the recipient. I also always use a fragrance free wool wash as you never know how sensitive the recipient may be when it comes to scents, or maybe you don't know what their scent preference is. I know a surprising amount of people who don't like the smell of lavender (I know, right?? That's just crazy talk to me!!) and who have aversions to all things fruity. In situations like this fragrance free is definitely the way to go. Allure's version truly is scent free and no matter how much or how hard I sniff away at the bottle, I can't pick up a single hint of anything. There's no weird plastic-y, chemical smell that I sometimes find in other scent free washes by other companies. There's just...nothing. Which is the whole point, so thumbs up! One thing these washes all had in common that I really liked was that they were low sudsing, suggesting either a lack of or very low volumes of sodium lauryl sulfate (which can be really harsh on fibres). Not only had I soaked hand knits but also leggings and undergarments. I didn't see any pulling of colour from any of the items and noticed that the undergarments appeared brighter when they dried. I also liked that the fragrances weren't strong during the soaking process and when all the items were dried, only a nice hint of scent was left. I decided to save the bottle of Woodland Mist for any and all knits that I make for the Mister and reserved the Fragrant Free bottle for future gift knits, meaning that the Prairie Breeze is all mine! I am not affiliated with company mentioned in this post. I received no monetary compensation from said company for my review. I was sent a sample pack of the product for review purposes. The opinions I've written are my own and I will not be receiving any commissions from the links in this post. Ack! I'm SO sorry!! I checked it out and sent an email about that issue. Once I find out more, I'll definitely let you know! So interested in this product - I use a ton of wool wash! I had the same experience as Flora, went over to the website to sign up for the free sample, but cancelled it because $20 shipping is too steep for a lil' old sample. I emailed them too. The scents sound really amazing! Just wanted to update - Allure got back to me and they've fixed their system. The samples now ship for just $2 to international addresses, which seems completely reasonable to me. They were great!